The most fundamental pursuit of any Nugget is survival, which does not always come easily. As a result, Nuggets typically choose leaders whose agendas will most likely keep everyone alive. Much like any civilization, Nuggets need leaders. These are the best of the best -- or, at least, that’s what their campaign posters say. The most fundamental pursuit of any Nugget is survival, which does not always come easily. As a result, Nuggets typically choose leaders whose agendas will most likely keep everyone alive. 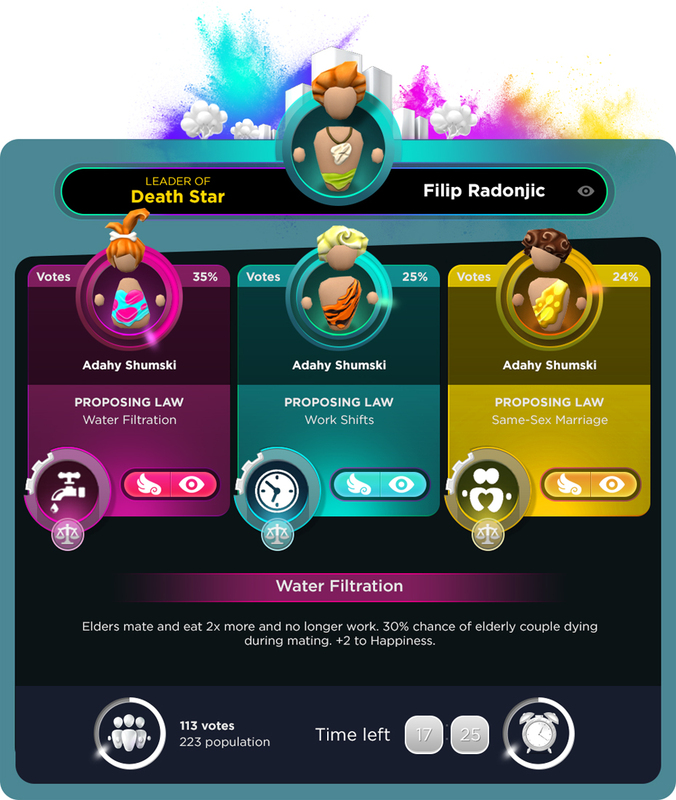 Leaders in The Universim will come up with important laws and agendas that can alter your civilization’s evolutionary path and social structure. Every 2 in-game years, your civilization will vote for the next Leader. There are usually three candidates, and each will bring their own list of laws/changes in the event they are elected. This process will occur with or without your intervention. You can allow Nuggets to choose their own Leaders, or you can weigh in on which you think is best. Every adult Nugget in your civilization will cast a vote towards the candidate they prefer. Their selection is based on their internal preferences and traits. For example, lazy Nuggets will vote for leaders who promise fewer work hours, while Nuggets who like to eat will vote for candidates who promise more food production. In the UI, each candidate will have a list of laws or changes they plan to implement below their names. Every candidate will have their owncolour to distinguish them from their competitors. A voting bar will showcase the voting progress of each candidate, which will indicate who is currently in the lead. In rare cases, candidates might change their proposed laws/changes to something completely different. Accidents happen: Nuggets are fragile creatures who do not react well to having a boulder dropped on them. Actually, there are many potential accidents that could befall a candidate. 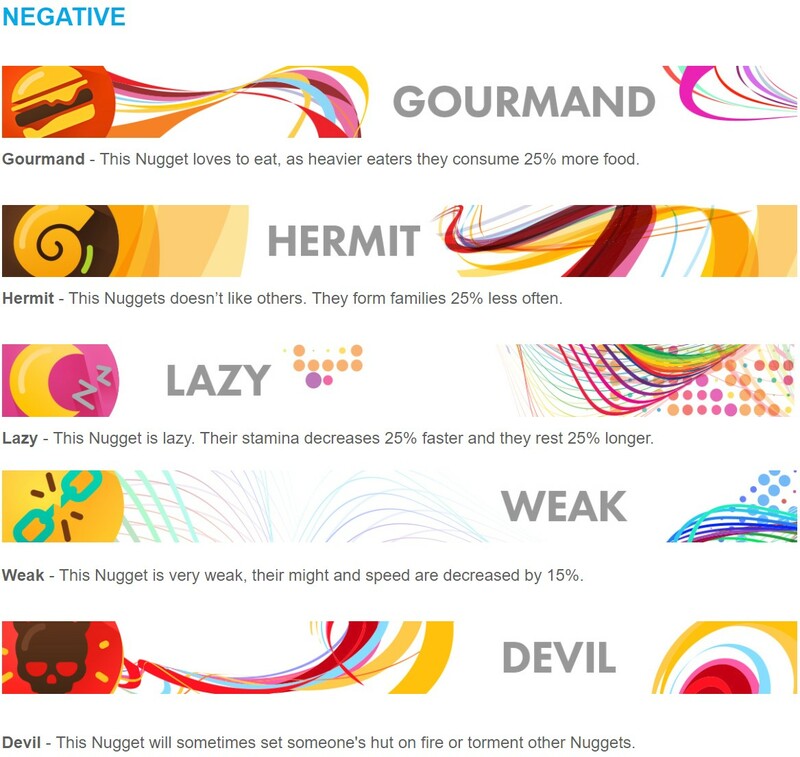 Nuggets know all too well that nature is a cruel mistress. Sometimes, Nuggets just happen to spontaneously combust, get struck by lightning, or end up floating through space. It’s a mysterious world they live in. Blessings: Murder isn’t always the answer. There is a far less brutal way of influencing the election process, which involves blessing your preferred candidate. Some downsides do exist, though. Firstly, it will cost you Creator Points. Secondly, it might not work. It can happen that the candidate who is most qualified for the job loses to a chimpanzee, even with your blessing. However, at least blessing Nuggets won’t permanently scar the mental state of those who witness your “accidents”. Labor Laws - Nuggets only start work after they turn 10. Lifespans +10 years. Happiness +5. Work Shifts - Nuggets take shifts working. 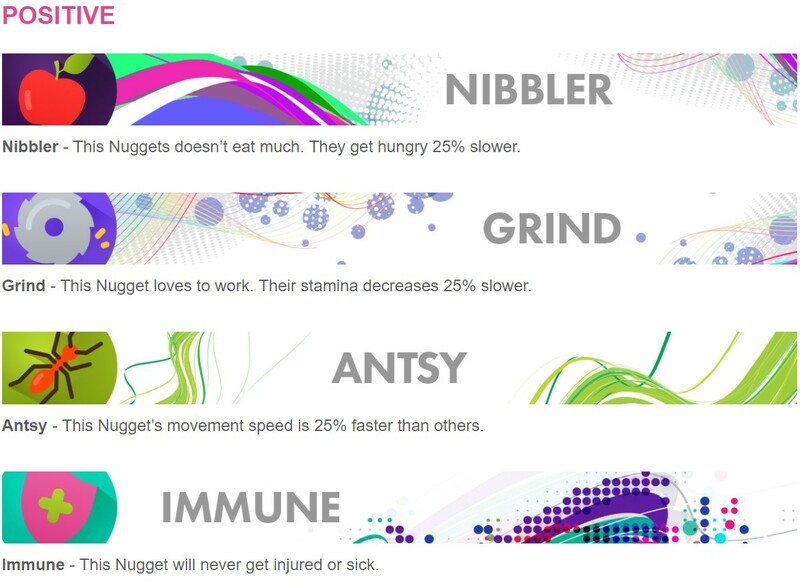 Increases efficiency of buildings (by reducing time that Nuggets are gone to rest/eat) and increases Happiness (+5). Pollution Control - Reduces pollution by 30%, but players can no longer build factories that pollute. Please note that this feature is a work in progress and will only become available after the Steam release.